By using a long telephoto lens, I was able to compress the foreground, middleground, and background to make this enormous marble head of Karl Marx suddenly loom before us within a forest full of graves. Highgate, a wooded Victorian city of the dead sprawling in the middle of suburban London, is rich in such incongruities. This image places us in the midst of this dark and haunted forest -- the scale incongruity of the oversized head of Marx sends a shiver down our backs. Four years after I posted this image on pbase, a blog entry about Karl Marx used this photograph as an illustration. Anna, thank you for your wonderful comment. This image has always been among my favorites - I made it a long time ago, and it has stood the test of time. Which is no mean feat -- I am very hard on my own photographs. But I felt much of what you felt as I made this and I still do. And thank you, Nanchito, for your comment as well. The scale incongruity of Marx's head was shocking and compelling. His ideas have certainly changed history and I like your concept of this being a grave for his ideas as well as his body. The great size of Marx´s head gifts an idea of his contribution to the understand of economy, filosophy and history. This is not only the crave for a man: This is the tomb for the idea of being the most rich between the richest. When I saw this and and the title, I thought "Oh my." Something shocked me. Okay, not as in surprise, but "shock" as in...well, like electrified? The way it haunts. That face stared straight through, the overgrown greenery...I thought of it as Marx staring straight through time, through all the years that the world has been turned upside-down by his ideas, to this very present moment. It's like you could feel his undying presence right now. The way he's clearing illuminated, compared to the graves which are in only shadow, emphasizes his immortality through time. I love this. Thanks, Mikel, for this comment. Just as you, I visited London's mysteriously haunting Highgate Cemetery a few years ago. Actually, it was more than a "few" -- try almost 20! At that time, of course, I was still using film -- Kodachrome, of course. And an Olympus OM-2 SLR. Talk about ancient history! I love shooting in cemeteries. As my wife is always quick to remind me, "my subjects never move or talk back!" Karl Marx sat still for me here -- I was struck by the incongruous size of his head more than anything else. It is by far the biggest "head" in that entire cemetery. I knew that I had to contrast that head with a spooky context, so I walked far into the wooded part of the cemetery, putting on my 300mm telephoto lens to compress distance and create four levels of meaning. The blurred dark foreground creates a frame to pull the viewer into the image, and the bright green leaves at left create a contrasting middleground. I focus on Marx and the nearby gravestones just in front of the background, creating the focal point of the image. My fourth layer, the trees and dark tunnel behind Marx, provide a background that keeps the eye moving past Marx, deep into the gloom of his haunted domain. I was a fiew years ago in this cementery and it is realy impressive it is like an overbooking of burrials grave stones that are quite old and interesting enough to doo many photos pitie that I hadn't brought my camera and whent with a normal compact film one so couldn't doo too many marvelous photos of it. In this case, I recognize that you've managed to get the spooky part of it perfectly, the graves in the shadow of the trees and vegetation as in counterlight and the mighty head of Carl Max, because it is big, in the light like watching cerfully at wat you doo. "Philosophers have intended to understand reality but the question is to change it", or something like this, right? ;) four years make me doubt now. I never thought of that message, Clara -- but you are right. I am sure Marx had no interest in who slept next to him for eternity. For him, there was no afterlife, no heaven, no hell, and no need to worry about his roommates. I read another incongruity. The man that said that "religion is the opium of the masses" is surrounded eternally by Christian crosses. What a destiny!! Yes, Nut -- Karl is a long way from his biggest fans. Only Karl Marx is here, nor for his people. Thanks, Michael, for pointing out still another incongruity! Not only was it incongruous to discover this huge head sitting in the middle of a forest glade, but the political context you mention adds still another layer of incongruity. Thanks for bringing more meaning to my picture! Ahh the father of communism buried in a capitalist land. Incongruous and ironic. Beautiful, peaceful image. Workers of all lands, unite ! Thanks for the comment, Marek. I guess this picture can offer room for two entirely different interpretations of immortality. Vanessa offered one view with her comment --the grave of Karl Marx becomes a metaphor for a "God like figure waiting at the gates." Someone else might say that Marx seems about to be absorbed by the forest that surrounds him. If not for the efforts of the cemetery keepers, he would soon be lost in the undergrowth. In this view, immortality is temporary -- all of us eventually become dust (or weeds in this case). No doubt, you can probably offer a third interpretation. And that was my intention -- to offer this image as food for thought. A powerful statement on immortality. Thanks for your comment. Some images tend to prod the imagination. This might be one of them. Hi Phil Douglis,Iam Linda Baileys son..She had asked me to look at your work.I found myself lost in this piece. Vanessa strikes gold again! A haunted scene, to be sure -- and reluctance, indeed! You see each symbol in turn, and weave a story from your imagination that articulates the very point I was trying to make, but did not fully realize it at the time. By the way, Phil, "Guest" was me. This picture seems to give the viewer a reluctant glimpse of the afterlife. 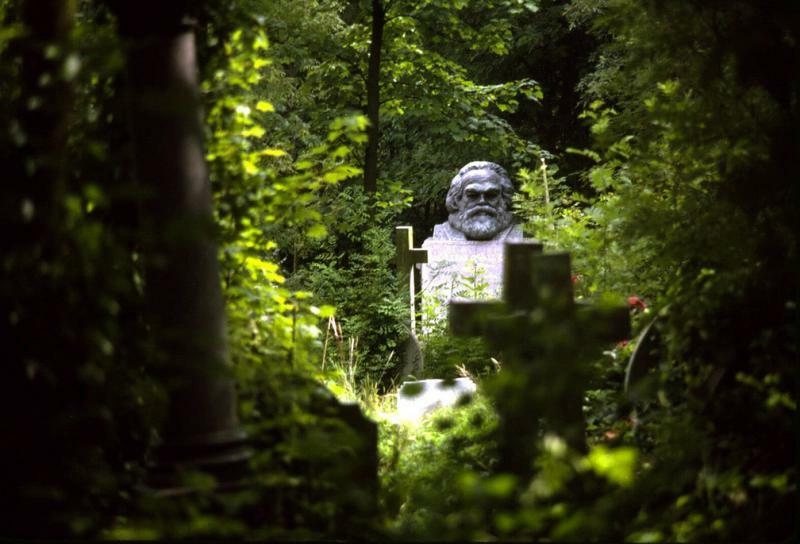 The lush greenery symbolic of paradise, the cross headstones denoting faith, and if one didn't know it was Karl Marx, one could easily interpret the head of the man as a god-like figure waiting at the gates. this image may be small in size but not in content. It is enormous. The darkness in the foreground and sides draws viewer in..